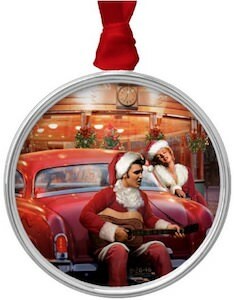 This is a very amazing light blue Christmas ornament that features The King Elvis Presley, find a large color image with his hair slicked back and and black leather jacket with a print of his signature. The neck of the guitar has a print of his name leading up to a silhouette image of Elvis standing on stage with his guitar and microphone stand. Made to be very durable and still really lightweight also with a high quality print of vibrant bright colors, this is a great gift for any Elvis Presley fan or for yourself. It also comes in a nice window box package just in case you want to collect and display this ornament while keeping it in mint condition.